Its been always raining this week. The annoying thing is, it’s always in the afternoon when all we could think is the remaining hours before we call it a day. An hour of raining in our country could cause a heavy traffic and some freaking MRT disasters. The good thing about raining and when we are comfortable in our home is the cold breeze of wind and a hot bowl of soup. One of the comfort food the we Filipino loves is lomi. Batangas is famous for this delicacy. Batangas lomi is made up of thick flavorful soup with lots of ingredients, from pork, pork liver, kikiam and vegetables. 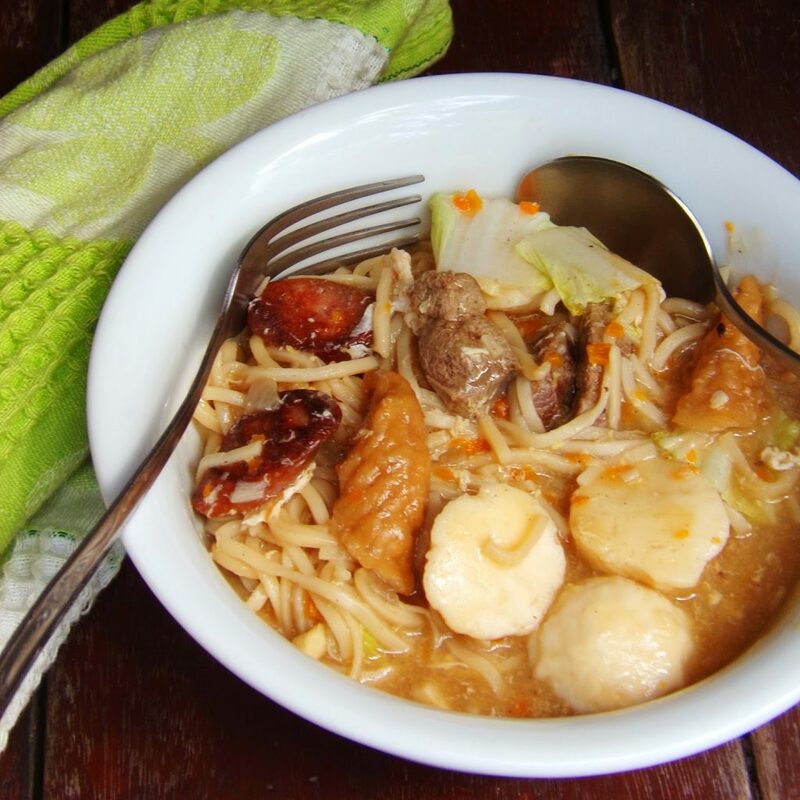 What set it apart form other lomi is its flavorful broth that is made from simmering the beef or pork shanks for several hours before incorporating the other ingredients. Kusina ni Teds’ version is a cheaper version of lomi. Even though I want to use pork or beef shanks I have to think of my and my parents blood pressure so I go for a less fatty version. I simply use pork liver, chorizo macau, kikiam, squid ball, left over carrots and Chinese cabbage. Since I’m not fond of the store bought fresh egg noodles because of some after taste, I decided to use the dried egg noodles. Compared with fresh noodles, dried noodles has some bite which I really like. Heat wok and add oil. Saute chorizo until brown. Add garlic and onion, saute until garlic is golden brown and onion is translucent. Add pork liver and saute until brown. Add squid ball, kikiam and carrots. Add bouillon cubes and water and simmer for 15 minutes. Add beaten eggs. Dissolve cornstarch in water and add to the broth. Season with soy sauce and pepper. Add dried egg noodles and cook for another 10 minutes or until the noodles is done. The noodles should still be sightly firm with a little bite. Served with soy sauce with calamansi. You can add some chili for added kick.